I don't normally advocate this sort of thing, but this is a lighter version of the best comfort food out there - chicken pot pie. We looooove chicken pot pie, and would probably eat it every day if we could. But you just simply cannot do that and continue to fit into your pants. So, I decided to come up with a lighter version, because we were watching the Oscars. I couldn't face Angelina Jolie's arms (or leg) with a 2-sticks-o'-butter pot pie in my mouth. The result was a success, and I highly recommend it for a healthy but hearty meal. 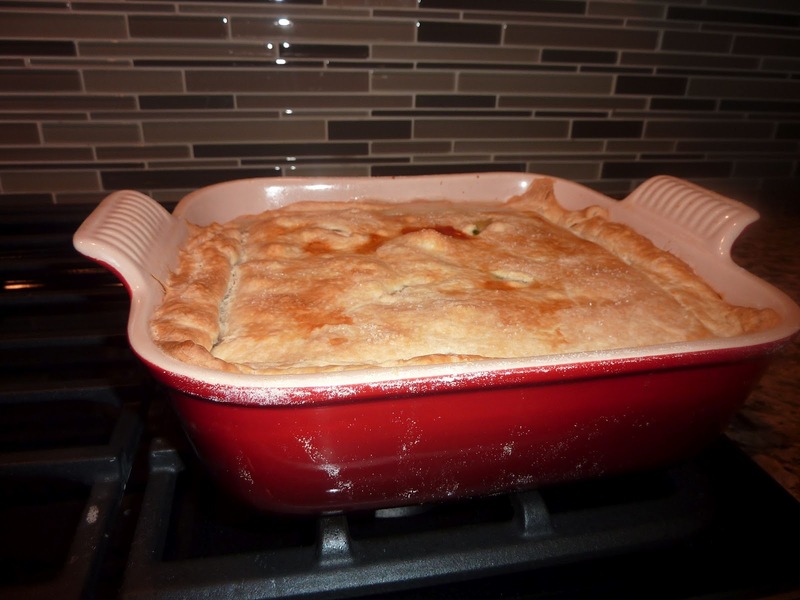 It of course does not taste like this super rich and amazing pot pie, but it's darn close. Start by preparing the crust. Using a food processor (or a pastry cutter), combine the flour, baking powder, salt, and cold butter until it forms large beads. Blend in the egg yolk and milk. Reserve the egg white. Add ice cold water until the dough comes together, about 1-4 tablespoons. Knead the dough together, wrap in saran wrap, and refrigerate for at least an hour. In a large pot, heat the olive oil and butter over medium heat. Add the onions and cook for about 5 minutes. Add the carrots and broccoli, cook for about 5 minutes more. Pour in the wine and let it reduce a little. In a separate bowl, combine the flour and about 1/2 cup of the milk. Add it to the onion mixture, stirring thoroughly. Pour in the remaining milk and chicken stock. Mix well and bring to a low boil. Allow the liquid to thicken, about 10-15 minutes. Add in the peas and onions, continuing to stir. Throw in the herbs and seasoning. Reduce the heat to low. Preheat the oven to 350 degrees. Roll out the dough to about 1/4 inch thick. Pour the filling into your pie pan of choice. Add just a bit of water to the reserved egg white; using a pastry brush, coat the edges of the pan with the egg wash (to prevent the crust from sticking to the pan). 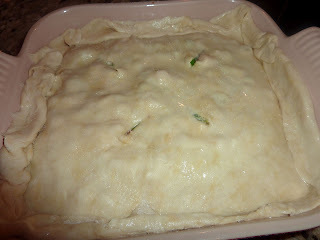 Cover the filling with the crust, cutting off any excess and pinching the edges to seal. Cut a few small slits in the top, then brush with egg wash. Sprinkle with sea salt and freshly ground pepper. Bake for 1 hour at 350. Let sit for about 15 minutes before serving, even though you won't want to. Life is full of obstacles. 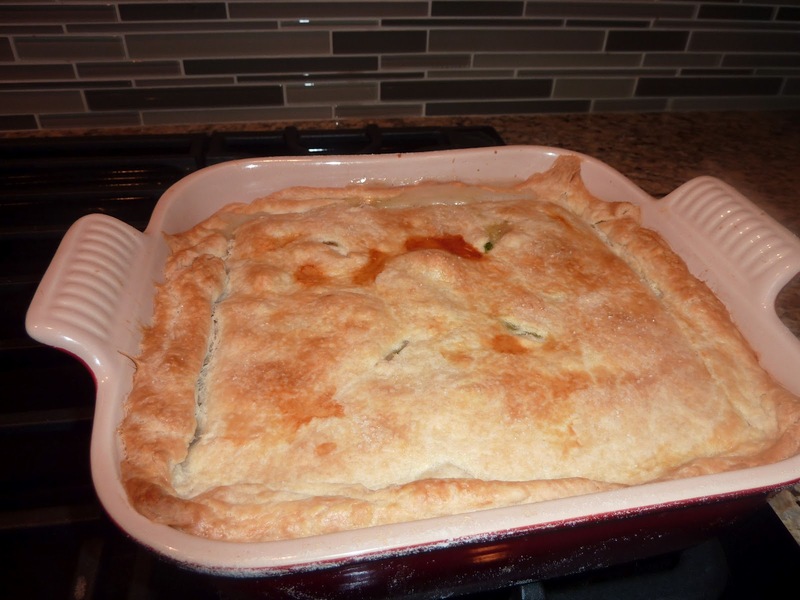 And there you have it: a tasty and healthy pot pie. An oxymoron. Of course, there are several things you can do to make this recipe easier. I think frozen phyllo dough, puff pastry, or biscuits work wonderfully for the crust, and you could use a rotisserie chicken from the grocery store. But, I like to create projects for myself so homemade crust is right up my alley. Enjoy this healthy post, it could be awhile before you see another one. **For a gluten-free version, substitute about 1/4 cup corn starch for the flour and use a frozen gluten-free crust.